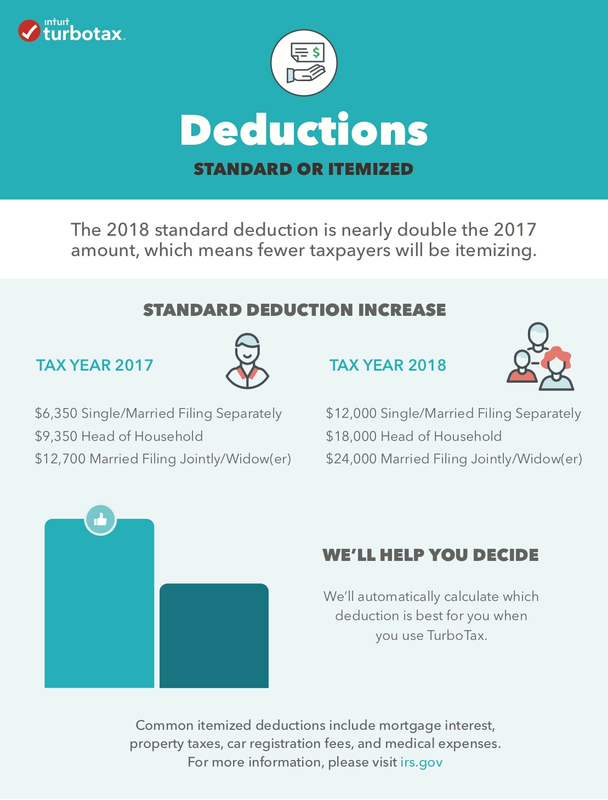 The standard deduction is a fixed dollar amount that reduces the amount of income you get taxed on. Think of it as tax-free income that you get to keep before taxes are applied to the rest. The Tax Cuts and Jobs Act that was signed into law in late 2017 substantially increased the standard deduction for tax years 2018 through 2025 – in fact, we estimate that nearly 90% of tax filers will take the standard deduction this year, up from an estimated 70% last year. Select your filing status below to get your 2018 standard deduction amount. Please note that if someone else claims you (or your spouse, if you're filing jointly) as their dependent, your standard deduction will be less than the amounts shown below. Your standard deduction starts at $12,000. Add $1,600 if you were born before January 2, 1954. Add $1,600 if you were blind as of December 31, 2018. Example: Single filer Joe, who was born in 1972 and has been blind since birth, gets a standard deduction of $12,000 + $1,600 = $13,600. Your standard deduction starts at $24,000. Add $1,300 if you were born before January 2, 1954. Add $1,300 if your jointly-filing spouse was born before January 2, 1954. Add $1,300 if you were blind as of December 31, 2018. Add $1,300 if your jointly-filing spouse was blind as of December 31, 2018. Example: Joint filers Pat and Tracy, who were both born in 1941 and are not blind, get a standard deduction of $24,000 + $1,300 + $1,300 = $26,600. Your standard deduction starts at $18,000. Example: Head of Household filer Mary, who was born in 1963 and is not blind, gets a standard deduction of $18,000. Example: Marguerite and Phillip, a married couple who are filing separate returns, were both born in 1952. Neither one is blind. They each get a standard deduction of $12,000 + $1,300 = $13,300.